Brad Delong calls for economists to "mark their beliefs to market" - that is, reassess their position when the facts suggest that they might have been wrong - and commendably shows us the way here. He is also very hard on economists who fail to do so; I only wish the UK media would be equally critical of those whose analysis has proved wanting (I could suggest a few names..). But I was talking about me, of course. I have just despatched my reply to the usual end-of-year email from Chris Giles at the FT asking for my economic predictions for 2013. You'll have to wait until very early next year to read them and those of others; but I thought it was worth looking back at what I said in December 2011 (to the FT and separately to the New Statesman), which I reproduced here at the time. The British economy is lacking productive investment, but not for want of investment opportunities. Banks and large corporations are sitting on cash, households are holding back on large purchases (including of housing), and the public sector is slashing its investment flow. This shortfall reflects the deficiencies of the British domestic financial system, some of them longstanding from well before 2008, as much as lack of confidence in future prospects, and responsible macroeconomic policy can address both problems. The current British coalition government’s economic policy program, however, instead is intended to address a lack of savings, not of investment, and is pursuing that mistaken priority in a self-defeating way. The economic issue facing the UK therefore is not just one of Plan A versus B, or of the amount and pace of austerity versus growth – the issue is that the UK needs investment friendly structural reform and stimulus, not fiscal consolidation as a goal in and of itself. "Ubi solitudinem faciunt, pacem appellant"
The FT article that appeared yesterday under the name of Olli Rehn, the European Commissioner for economic affairs, could have been written by a fairly unsophisticated economic cliche-generator: "we must stay the course..light at the end of the tunnel." What caught my eye (and those of others, including Paul Krugman here and Kevin O'Rourke here) was that Mr Rehn and other eurozone policymakers have been saying the same things for the last two years (so indeed have policymakers in the UK, but that's a different story) and have yet, as Brad Delong would put it, to "mark their beliefs to market". Indexing benefits to inflation is not "unsustainable"
But we have to acknowledge that over the last five years those on out of work benefits have seen their incomes rise twice as fast as those in work. With pay restraint in businesses and government, average earnings have risen by around 10% since 2007. Out of work benefits have gone up by around 20%. That’s not fair to working people who pay the taxes that fund them. Those working in the public services, who have seen their basic pay frozen, will now see it rise by an average of 1%. A similar approach of a 1% rise should apply to those in receipt of benefits. That’s fair and it will ensure that we have a welfare system that Britain can afford. "In five years, out of work benefits have risen 20%, earnings 10%. That is unsustainable.."
"In the event of nuclear war or an asteroid strike, it is possible the UK government might not pay its debts. Then we'll have other things to worry about. Otherwise, it will, simply because it can - and because the consequences of not doing so are dreadful...Saying that there is any meaningful probability that the UK will default on its debt - which is what downgrading the UK means - is not to take a particular view on the UK economic or fiscal outlook. It is simply not to understand what you are talking about...So how should the government, and the markets, respond to the rating agencies? The former should, and the latter in my view will, simply ignore them." Just as talk about a "double-dip recession" after the unusually bad second quarter growth figures was overdone, so was the euphoria about Britain "surging out of recession" after the third quarter figures. The official forecasts from the Office of Budget Responsibility today are for growth of 1.2 percent in 2013 and 2 percent in 2014; very similar to NIESR's forecast. These, further downgraded, forecasts mean the economy won't be growing faster than trend until 2015. So the underlying picture remains much the same as it has for the last two years - slow (or no) growth, and certainly nothing like the sustained recovery we should have seen by now. The Department for Work and Pensions today published an analysis of the impacts and costs of the Future Jobs Fund. The impact analysis was peer reviewed by Helen Bewley of NIESR; the methodology and approach is very similar to that used by DWP, and also peer reviewed by NIESR, in previous impact analyses of Work Experience and Mandatory Work Activity, and Helen's own research on reoffending for the Ministry of Justice. The bottom line is that the impact of the Future Jobs Fund (FJF) on the chances of participants being employed and/or off benefit was substantial, significant and positive. 2 years after starting the progamme (so long after the programme itself had ended, so the participants were back in the open labour market), participants were 11 percentage points more likely to be in unsubsidised employment. The Treasury Committee, cont: "My concern is not the economics"
I, and my colleagues Angus Armstrong and Simon Kirby, gave evidence to the Treasury Committee on Tuesday November 13th. The full uncorrected transcript is now available. Or you can watch. My discussion of one specific economic issue - why are gilt yields so low - is here. However, I thought I would post in full my exchange with Jesse Norman MP. [Note that the transcript below is uncorrected and that the final form of its publication has not yet been approved by the Committee, although it is accurate as far as I can tell. On the video, it starts at about 10:35]. I, and my colleagues Angus Armstrong and Simon Kirby, gave evidence to the Treasury Committee on Tuesday November 13th. Should you have time and inclination, you can watch. As you would expect, we covered a range of topics: the fiscal framework and fiscal policy, multipliers, the "productivity puzzle", etc. However, I was rather surprised by the tone of the questioning on one topic: why are long term interest rates (gilt yields) so low? Illegal migrants: can't even get themselves arrested? How many illegal immigrants are there in the UK? Unlike other such questions - how many 12 year olds are there in the UK? how many gay Jews? - where, although we don't know the exact answer, either survey and administrative data allows us to make an informed and reasonably accurate guess, we don't know, even approximately. But a new initiative by the Metropolitan Police suggests that the number may in fact be surprisingly low. Is austerity – particularly the fiscal consolidation programmes currently under way in most European Union countries - self-defeating? This question has been thrown into sharp focus by the IMF’s belated reassessment of the magnitude of the “fiscal multiplier” in major industrialised countries during the Great Recession. New research from NIESR, published in the National Institute Economic Review (£), makes the first attempt – to our knowledge – to model the quantitative impact of coordinated fiscal consolidation across the EU, using the National Institute Global Econometric Model. Did David Cameron's comments at Prime Minister's Questions - "the good news will keep on coming" - today move the sterling exchange rate? The first estimate of UK GDP in the third quarter of 2012 will be released tomorrow, and he will have seen it this morning; not surprisingly, his remarks have therefore been interpreted as signalling that the numbers will be good. For example, Nick Robinson said: "The PM was giving a strong hint that tomorrow's GDP figures will be positive". How did we get into this mess and what can we do about it? The Department for Business, Innovation and Skills (BIS) asked me (as well as others) to record a brief video on the origins of, and potential policy responses to, the UK's current economic problems. The video, which lasts about 7 minutes, can be seen here. Obviously, the views expressed are my responsibility and mine alone, not that of the Department or government. New research, undertaken for the Ministry of Justice by Helen Bewley at NIESR, shows that increasing the punitive element of community orders, as proposed yesterday by the Prime Minister, has the potential to reduce re-offending. But there are potential pitfalls: reform needs to be cautious and based on the evidence of what works in reducing re-offending. Figures for the public finances vary a lot from month to month, partly predictably, partly not; and they're invariably revised, often by quite large amounts. Hence, I've resisted updating this July post, which explains that while the government's repeated claims that "we've got the deficit down by a quarter" are true if you compare 2011-12 with 2009-10, this was mostly achieved simply by cutting public investment. But now seems a good time to do so, since today's public finance figures mark the half way point of the financial year, and - in contrast to recent months - the figures are not nearly as bad as expected, with revisions meaning that the first half of the year now looks significantly better. Nevertheless, there still isn't really much point in looking at month to month numbers; but the big picture is clear. Here's the total deficit (public sector net borrowing, excluding the purely financial transactions that distorted public investment in April 2012) and the deficit on the current budget, calculated on a rolling 12-month basis to eliminate seasonality as far as possible. On October 15, I spoke in a debate at the Houses of Parliament entitled: "Time for a radical rethink? The economics of deficit reduction". The debate was organised by Professor Lord Richard Layard, by kind permission of the Speaker and Lord Speaker (who introduced the debate). It was chaired by Evan Davis. I joined Professor Paul Krugman of Princeton University, and Nobel Laureate in Economics, in arguing that premature fiscal consolidation in the UK had been based two key misconceptions: that in the absence of accelerated deficit reduction, bond markets would panic; and that fiscal consolidation would have little or no negative impact on growth. Bridget Rosewell, of Volterra Partners, and Stephen King, Group Chief Economist of HSBC, argued in contrast that austerity was a necessary corrective to the large debt overhang, both public and private, resulting from a financial bubble in the late 2000s and the resulting crisis. A summary of my argument appears in the Spectator here. Excerpts of the debate, and a follow up discussion between me and Bridget Rosewell, featured on the Today programme [about 15 minutes in] on the morning of 16th October. Here is a nice narrative piece by Russell Lynch in the Evening Standard. Here is the full recording (audio only) of the debate (it is about 1 hour 45 minutes). More on multipliers: why does it matter? The IMF's reassessment of the "fiscal multiplier" has sparked off multiple reactions in the economics blogosphere both in the US and UK. My initial reaction is here. Meanwhile, Chris Giles at the FT has weighed in, attempting to demonstrate that the IMF's analysis is not robust. I'd like to step back a bit now from the IMF piece (I'll return to it later) and explain why this matters. For the UK, and indeed other advanced economies, the most important point in today's IMF World Economic Outlook is not that it further explodes the myth - repeated again yesterday by the Chancellor - that low interest rates reflect policy "credibility" rather than economic weakness, or that it again emphasises that the UK and others could and should loosen fiscal policy in the face of that weakness. The IMF said all this about the UK back in July, as I explained then. Rather, it is that the Fund has radically revised its opinion about just how damaging the impacts of premature fiscal consolidation have been in the UK and elsewhere. "This is an extraordinary development. It really does call into into question the competence of ministers and of the government as a whole"
The Liberal Democrats call for a "mansion tax" (that is, a higher rate of council tax for the most expensive properties), possibly supplemented by some form of wealth tax seems to have provoked a peculiarly illogical misuse of one particular statistic among economic commentators who really should know better. Their objective appears to be to show that the "rich" are already paying more than their "fair share", and that any additional imposition would be both unfair and economically damaging. This is, of course, an entirely legitimate argument, both as a matter of ideology and of economics. But they will have to come up with some rather more convincing facts and evidence than they have so far. "People aren't interested in graphs": Chris Skidmore's response to my review of "Britannia Unchained"
[This article was originally published in Liberal Democrat Voice here in response to a specific request to comment on the texts reproduced below. I have made many of the arguments below in previous blogposts, so regular readers may not find much new, but for others it may be a useful summary]. "Conference recognises that the difficult decisions taken by the Coalition Government have ensured the credibility of the UK government’s position in the financial markets allowing the UK to borrow at record low rates"
"Conference also notes that it would be a mistake to attribute record low public sector borrowing costs to accelerated fiscal consolidation rather than to a flight to relative safety." As [Daniel] Hannan points out in his book, Britain is the seventh largest economy in the world, the fourth largest military power and the fourth largest exporter. The last point looked odd; surely the UK exports less than any of China, Germany, the US and Japan? So I questioned it, via twitter. First, Mr Hannan said:: "It is both true and surprising"; then, when I said that I didn't think it could possibly be right, he pointed rather vaguely to one of "the IMF, OECD, CIA Factbook". The economic and political history of the UK's ill-fated experiment with the Exchange Rate Mechanism (ERM) has been picked over many times, and the broad outlines of the story are well known (for a range of well-informed views, see here). So this is more of a personal recollection of how it felt at the time. It has been widely reported that the government is considering abandoning the second half of its fiscal mandate - that debt should be falling as a percentage of GDP in 2015-16. My view is that the short term economic impacts of this are limited. It's not really news; NIESR has been saying for well over a year that this target was unlikely to be met. What deficit reduction we've seen so far - largely achieved through cutting investment - hasn't exactly gone according to plan. Nor should we worry about the markets - they certainly haven't reacted yet and I doubt they will. As for the ratings agencies, any policymaker who pays them the slightest attention shouldn't be allowed near economic decision-making. 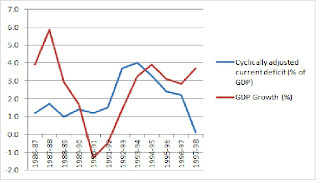 Chris Giles and the "NIESR chart"
"NIESR is doing the country a huge disservice in continuing to publish the NIESR chart alone"
There is plenty of spare capacity in the UK economy. The Office for Budget Responsibility’s (OBR) estimate of the "output gap" (a little over 2 percent) is unrealistically low; both we at NIESR and the International Monetary Fund (IMF) think it is higher (around 4 percent). And we may well be too pessimistic. Indeed, even with an improving labour market, unemployment is still nearly a million higher than official estimates of the "structural" rate (the NAIRU), while on the OBR's forecasts (which are likely to be too optimistic on growth in the short term, and too pessimistic on supply potential) unemployment will remain well over the NAIRU, and output well below potential, for years to come. With the economy persistently weak, there is a growing consensus among economists that premature austerity has done considerable unnecessary damage, and that there is a strong case for slowing fiscal consolidation - at least to restore some of the unnecessary and damaging cuts to public investment (which have been the source of most of the deficit reduction so far). However, others have instead argued that the problem is not on the demand side, but on the supply side, and that what is needed is a radical programme of deregulation - "cutting red tape" - especially in the labour market. NIESR has just published research estimating the economic impact of immediate versus delayed fiscal consolidation in the UK. The research was undertaken by Dawn Holland (NIESR), John Van Reenen, Professor of Economics at the London School of Economics and Director of the Centre for Economic Performance, and Nitika Bagaria, a Phd student also at LSE and CEP. John and I have written an article for the FT(£). The economy will contract by 0.5 per cent this year, but grow by 1.3 per cent in 2013. Consumer price inflation will fall below the 2 per cent target by the end of 2012. Unemployment will peak at 8.6 per cent in 2013. 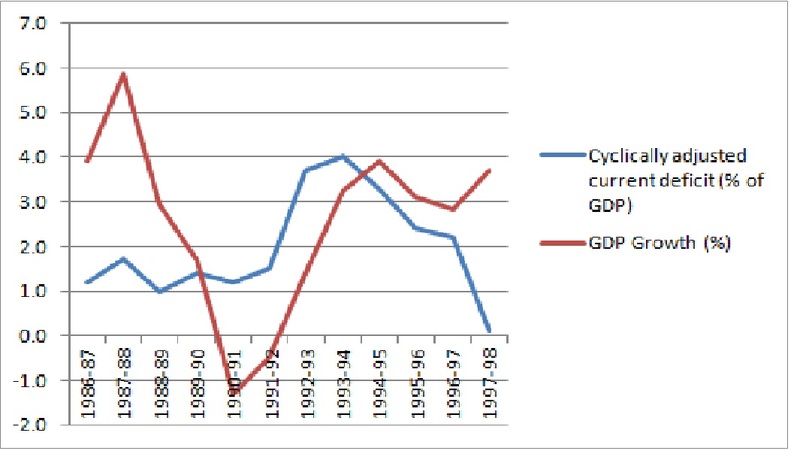 We expect the cyclically adjusted current budget to be in surplus in 2016–17. Concurrent slowdown in every major economic region: world growth to slow to 3.3 per cent this year and 3.7 per cent next year. All major countries opt for the same policies of near zero interest rates and fiscal tightening. European countries face remarkably divergent growth paths next year: Germany above trend growth and Southern Europe in deep recession. Tensions will heighten further. World demand below potential output growth means rising unemployment – in some countries even higher than seen in the Great Depression. "we have focused on the evaluation evidence and other research which indicates that EMA does not effectively target those young people who need financial support to enable them to participate in learning. It will be replaced by a scheme that does." Geoffrey M. Hodgson - Professor, University of Hertfordshire, UKJ. It appears to have become conventional wisdom in the Westminster village that the previous Labour government was wrong to give immediate access to the UK labour market to citizens of the new Member States of East and Central Europe that joined in 2004. The argument is that the decision was based on flawed analysis, in particular misleading forecasts of the numbers who were likely to come; and that influx of new workers from those countries damaged the employment prospects of British workers, especially the young and low-skilled. We are undertaking an unprecedented and concerted fiscal expansion, which will save or create millions of jobs which would otherwise have been destroyed, and that will, by the end of next year, amount to $5 trillion, raise output by 4 per cent, and accelerate the transition to a green economy. We are committed to deliver the scale of sustained fiscal effort necessary to restore growth. While the degree of coordination was somewhat exaggerated, there was a genuine collective determination to do what was necessary to ensure the financial crisis did not become a prolonged depression. DWP analysis shows mandatory work activity is largely ineffective. Government is therefore extending it.. The Department for Work and Pensions today published an impact assessment of the Mandatory Work Activity (MWA) programme. The analysis compares participants on the programme with "comparable" (as determined by sophisticated statistical techniques) non-participants. Briefly, what the analysis shows is that the programme as currently structured is not working. It has no impact on employment; it leads to a small and transitory reduction in benefit receipt; and worst of all, it may even lead to those on the programme moving from Jobseekers' Allowance to Employment and Support Allowance. The Government continues to abuse the data on "troubled families"
The Independent on Sunday today says that "the Government is to call for an end to what it describes as an "it's not my fault" culture of excuses, which has allowed 120,000 "troubled families" to avoid taking responsibility for their own lives." Eric Pickles is quoted as saying the programme will be "more forceful in language, a little less understanding". He added: "Sometimes we've run away from categorising, stigmatising, laying blame." The case for withdrawing the Winter Fuel Payment (and free bus passes) from better-off pensioners appears to have united all parts of the political and intellectual spectrum, from the Sun's argument that we should "stop wasting money on rich pensioners who don't need it" to the Independent's complaint that "hundreds of thousands of very well-off people of advanced years who are being subsidised out of general taxation." It is supported by respectable centrist think-tanks such as the Social Market Foundation and CentreForum. Indeed, is widely accepted that the only block to removing this absurd and wasteful subsidy to rich oldies is political - the Prime Minister's reluctance to renege on an explicit pre-election pledge, incorporated into the Coalition Agreement, particularly after the Budget fiasco over the "granny tax". "While a lot of families are struggling and have no disposable income, there are others who are quite cash rich but have nowhere secure to put their money where they can be guaranteed a decent return. Because interest rates are as low as they are, there is the potential to tap into this money and get it invested in infrastructure which will have a dramatic effect on Britain's long-term growth." The benefits of investing in infrastructure were twofold, the source said. "Not only will it provide a welcome kick-start to the economy at a time when growth is sluggish, but infrastructure improvement will also help Britain's long-term competitiveness and encourage investment from overseas. In that way it is a win-win situation." There is no meaningful difference here: the argument about the economics of whether we need more government borrowing (on or off balance sheet) to increase demand and investment spending is over. The issue for the government now is delivery and implementation: can they actually do it, quickly enough and on a scale big enough to make a difference? Too much time has been wasted already.